A spooky welcome to day 5 of the Feels Like Fall Blog Hop! 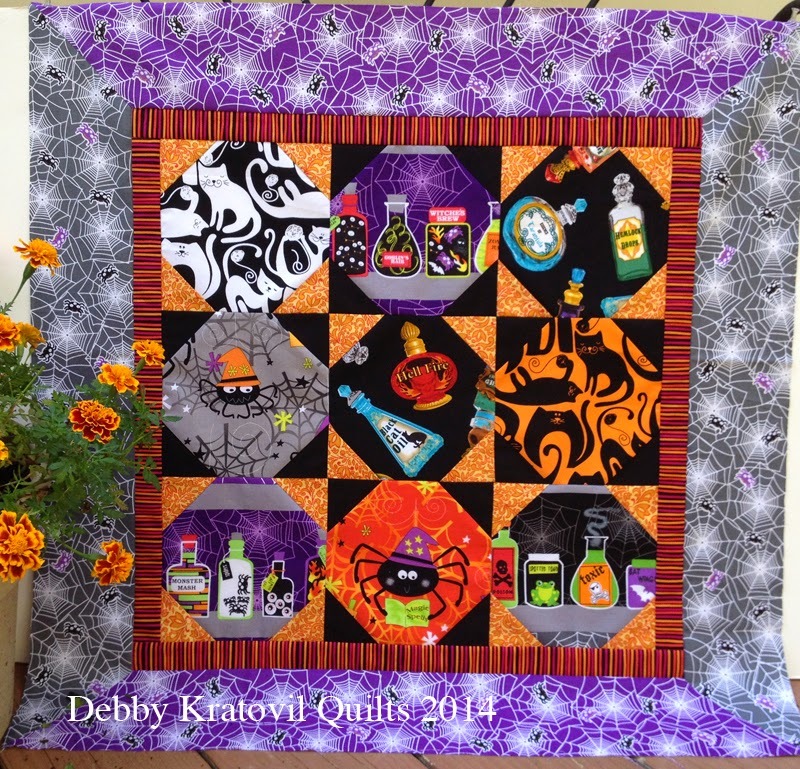 Today, Debby Kratovil of Debby Kratovil Quilts puts her creative talents into a design using the haunting Spooktacular collection. 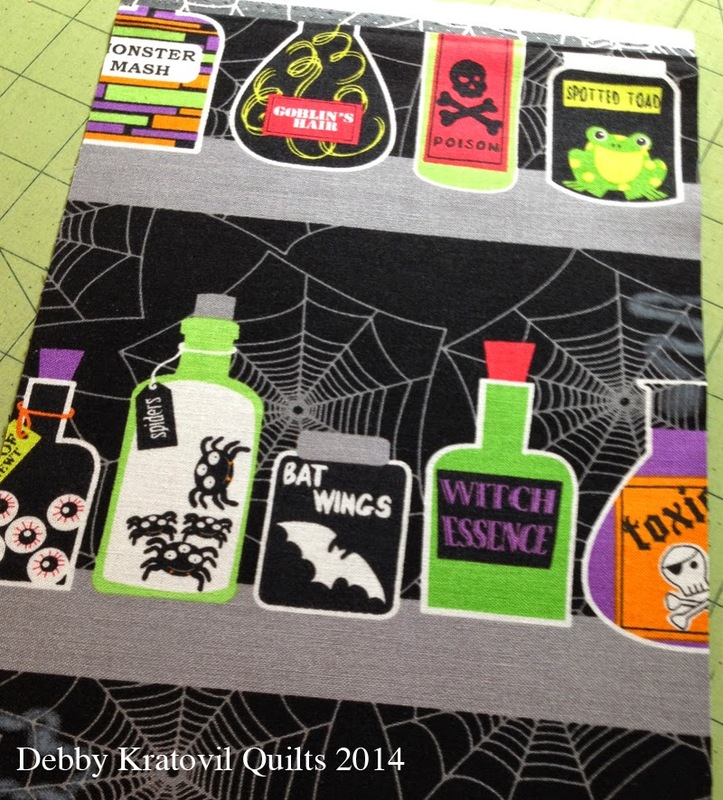 From friendly spiders to potion bottles, black cats, and spider webs, Debby's design uses it all in a Halloween wall quilt for your home! Check out her tutorial and then scroll to the bottom to find out how you can enter to win a bundle of Spooktacular to create a boo-tiful Halloween project. BOO! Uh, I mean, welcome! Thanks for stopping by to see what I've got behind the curtain. 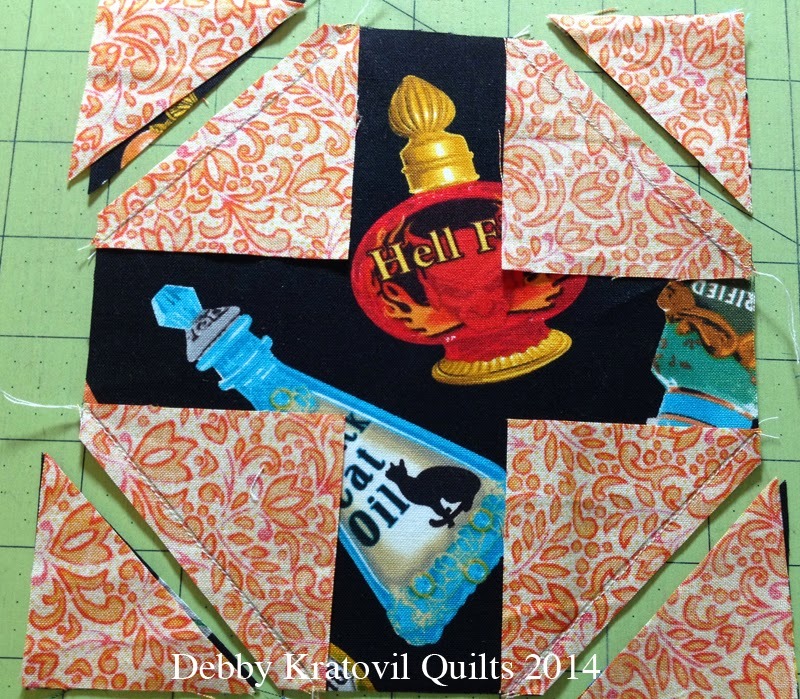 Let's see what I've done with this fun collection of Halloween fabrics. I will be making the Snowball block to showcase these novelty prints. 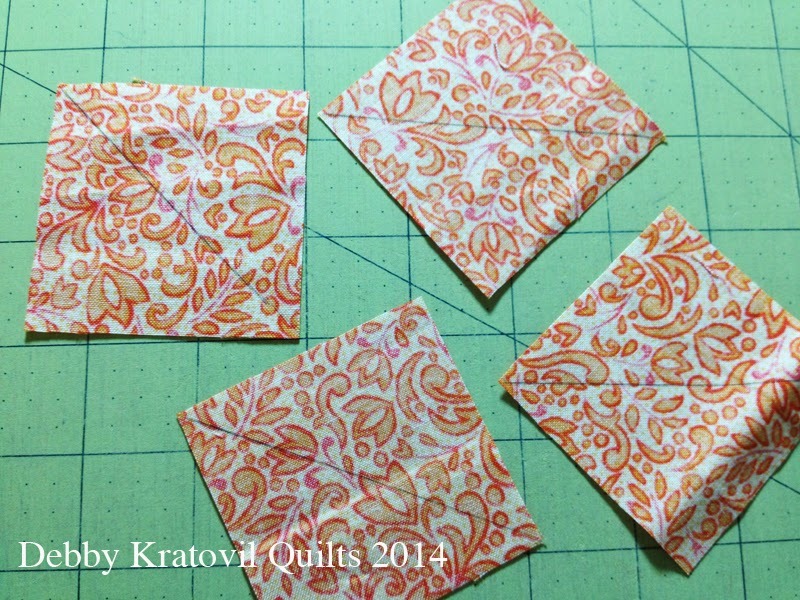 I cut the freezer paper 6-1/2" square. Lopped off the corners at 2-1/2". Now I need to replace the corners with contrasting fabric squares. These are cut 2-1/2" with diagonal lines drawn on the back as shown below. I cut a variety of 6-1/2" squares from the other prints; but here you can see my placement of these orange print squares on the fussy cut HELL FIRE square from above. Sew on the diagonal line; trim away 1/4" as shown. Then you need to press . . . Some of the fabrics will use a black square . . .
Just so I could keep track of where the squares will go and the orange and black triangles, I laid out my block parts before sewing. I call this auditioning. Let's look at a few of the fun fabrics. Happy spiders? Not the ones I find in my bathroom . . .
And what about bottles of funky brews? Bottles of spiders? Essence of witch? Yikes! So, what did I get? A happy, little Halloween quilt! Boo! 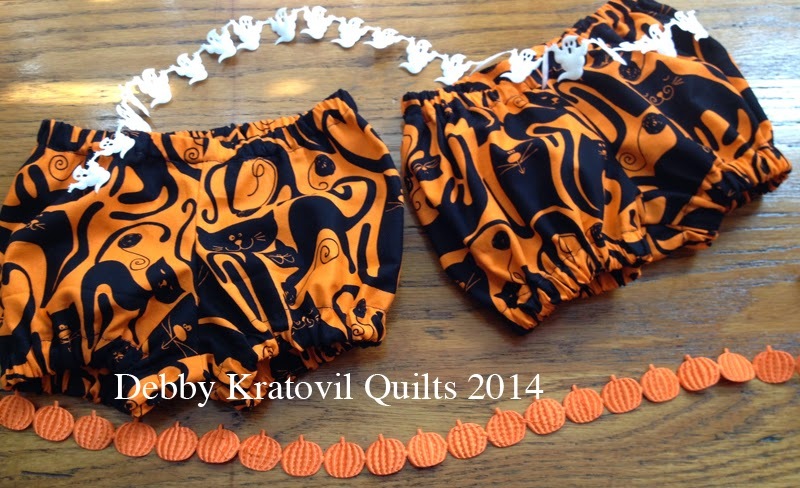 Twins born around Halloween need spooky bloomers! Thanks, Debby! 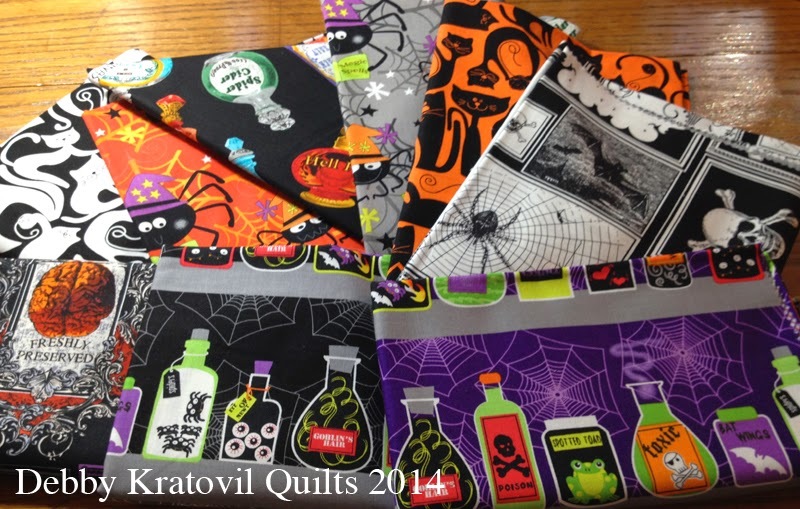 For a chance to win a fat quarter bundle of Spooktacular, sign up to follow our blog (see righthand sidebar) and/or our Facebook page. Leave a comment letting us know that you are as well as telling us about the types of things you make using FABRIC at Halloween. the giveaway will be open through Friday October 10 at 11:59 pm EST. And be sure to head over to Debby's blog to say hi! This is the fifth of six autumn and/or Halloween themed tutorials coming your way, from Wednesday, October 1 through Wednesday, October 8. Be sure to check out all six and enter for a chance to win a fun fall fabric bundle! Am I really the first? For Halloween I like to make wall hangings. I follow with Bloglovin. Thanks for the chance to win! Thank you for sharing this great tutorial on fuzzy cutting. With the help of these tutorials, I know I can do this. Sometimes I just need a little help and that's where these easy to understand tuts come in. This year I am going all out with Halloween sewing. I've made a mermaid costume for my 5 year old, am still working on a rainbow costume for my 3 year old, as well as making treat sacks for them both. I follow with bloglovin. I follow via email (laura84watt (at) gmail.com. I have made a few wall hangings for Halloween. Thanks for the great tutorial and giveaways. I'm a follower via GFC and Bloglovin. I love anything Halloween and make runners..totes...mini hangings. Debby did a great job with her tutorial. Thanks so much! I follow by email and love it. I love Halloween and am trying to make some fabric pumpkins to hang around the house. I LOVE those fabrics and Debby did such a nice job on her project. Those diaper covers are darling too. I follow via email and FB. I don't sew for Halloween; don't celebrate it. I follow you via email.............I have made wallhangings, including several colorwash pumpkins so that children (of all ages) can play with putting on Jack-o-Lantern felt faces, and have a quilt in process. 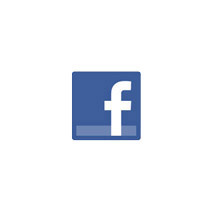 I follow by email and Facebook. Besides costumes, I've made a couple mini quilts for hanging or tabletop use, and good sacks are fun too! Love this snowball quilt. I would never have thought to use Spooktacular for it, but it is really darling. Your fuzzy block is just stunning! I follow by email and Facebook. I have made Halloween table runners and wall hangings. I don't do much decorating for Halloween but sometimes the fabrics are just too cute to resist! I follow via GFC and email. OMG! This fabric is so darn stinkin' cute!! Love it!! I make a new Hallowe'en decoration every year! This year I want to make a scary wreath for the front door. I am following via email and Bloglovin! - thanks!! I follow you via email. I don't have a scrap of Halloween fabric in my hoard and I have never made anything from Halloween fabric! I think that needs to change as I have two granddaughters who love Halloween! I follow you with blog lovin.' I try to add another Halloween wall quilt every year for my hubbie's outdoor Halloween display. I like to make totes and bunting! I follow by email. I like to make costumes! Debby's quilt is so cute and the diaper covers are really adorable. I like to make trick-or-treat bags at Halloween to give out to the kids. I am a follower via GFC/Bloglovin. Thank you so much for the giveaway. I follow your blog via e-mail. I make many things with Halloween fabric. I've made runners, trick-or-treat bags, costumes, pretty much everything! I follow on Bloglovin. Sadly, I haven't made anything Halloween yet - but I want to. Thanks! I already follow your blog via email. I have only made a jack-lantern wall hanging and a haunted house quilt with halloween fabric so far. This blog hop has been fun, I love fall. I already follow this blog and love it! I would make something for my daughter. She loves the fall and she always has a pumpkin carving party every year before Halloween. Blogger and FB are the way I follow. Forgot to say that I make trick or treat bags, pillowcases and wall hangings for Halloween. I follow. I made a table topper, had it completed before October! Yippie! I follow on Bloglovin'. I love decorating for all holidays and create table and wall decor. 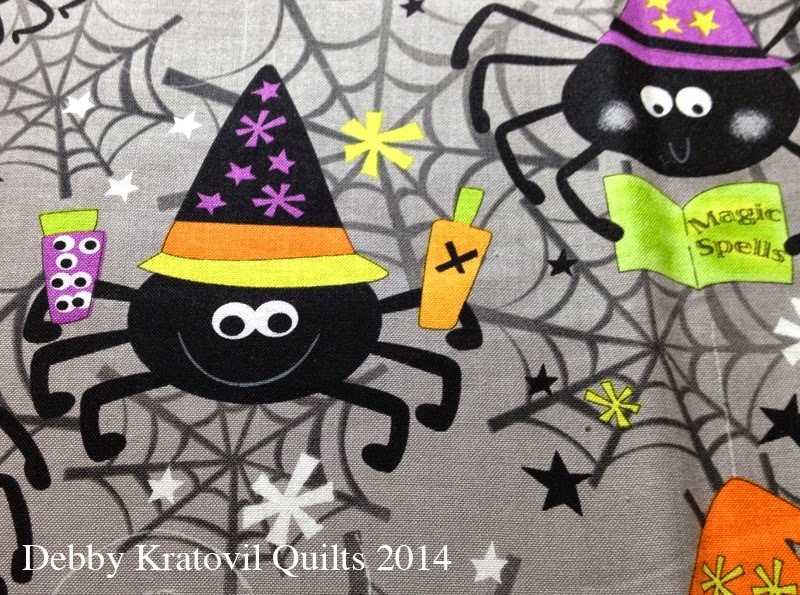 This fabric is spooktacular! and thanks for the chance to win! What fun fabrics, and a cute way to showcase them. Diaper covers are cute, too. I follow via email. I follow the blog by email. I like to make Halloween table runners. I follow with email and GFC. I actually haven't made anything with Halloween fabrics. I would like to make a table runner. Following on bloglovin'. I would make a Halloween quilt. I follow by e-mail. I like to make wall hangings. Thanks! I follow by email. I love the diaper covers. I make pillow cases, table runners and throws with Halloween fabric. And this line is wonderful. I once made a halloween postcard for someone in Germany -where witches are big all year round - but nothing else. I have a friend here in the UK who has made her daughter not one but four Halloween quilts over the years as her daughter is a real fan of halloween and spooktacular quilts. I already follow with Feedly! I am almost done with a reversible runner (Halloween & fall/Xmas) for the mantle. Next year I've got several little Halloween projects planned, just no time this year.. I want to make some stuffed pumpkins I just saw on Pinterest and a few pillows.. I want to make a witchy feet wall hanging. I follow the blog on email. What have I made for Halloween? I have a "punkin" vest somewhere, I think there were some spooky pj bottoms, and I have a "happy boothday" quilt started for a hair dresser with a Halloween birthday (she moved away). Ah, yes--there was the wacky, wonky Halloween house quilt I donated to the animal shelter auction. And matching Halloween sweatshirts for my mom and her friend. And a rather large Halloween quilt for my niece with a "trick or treat, smell my feet" panel in it. I follow by email. I like to make wall hangings for the holidays. Liked you on Facebook. I love to make wallhangings with Halloween fabric. I follow with GFC - I love the I Spy setting with the snowball blocks to use for either a cute wallhanging or could even be a fun lap quilt. Super cute quilt! I have some Ghastlies fabric that I think would be fun made with this design. I'm a follower on BlogLovin. Awesome giveaway! Thanks for a chance to win. I follow via email. Very cute, I make wallhangings and throw quilts for Halloween (I have several) and I'm working on another. 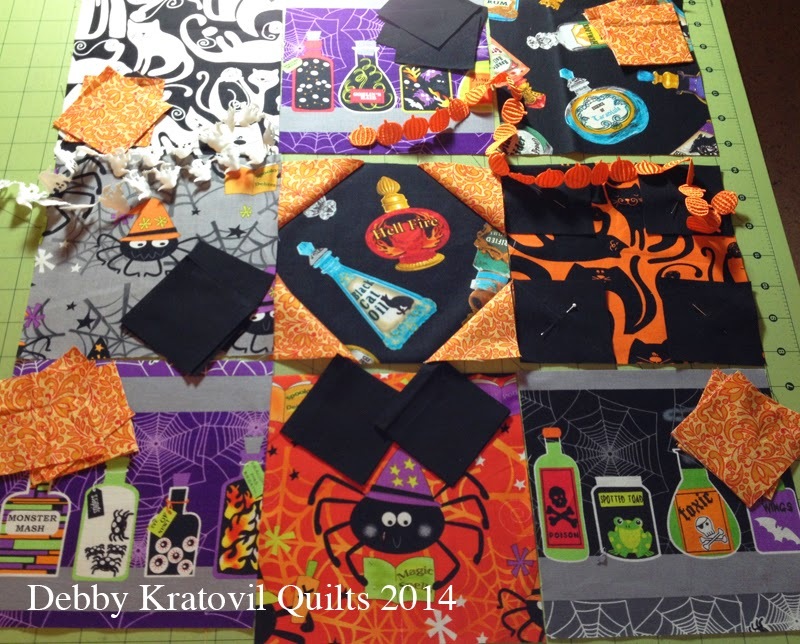 first Halloween quilts were a wallhanging and matching placemats! I follow via email and I like Benartex's Facebook page. I like to make table runners and wall hangings with cute fabric. I make costumes and treat bags with cute Halloween fabric. I follow on bloglovin. I have made Halloween quilts for my nieces and grandaughter. I am in the process of making themed runners as a Christmas gift for my neighbor and a Halloween runner will be the first I make. I follow your blog on Bloglovin and read every post! My Halloween projects this year are two table runners...one for me and one for my best friend! I follow via email. 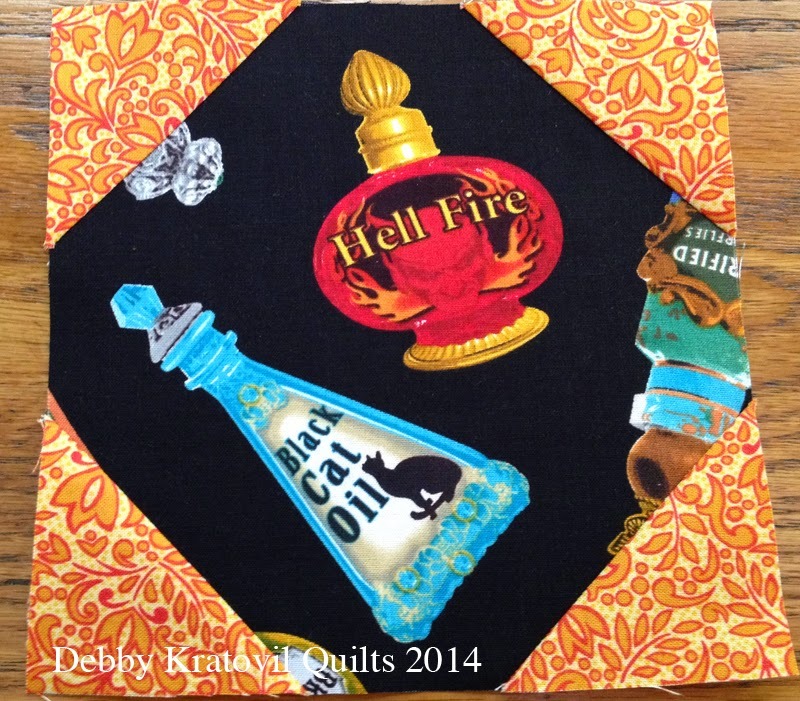 I make Halloween potholders, placemats, napkins, table topper, mug rugs, and coasters. I follow via Bloglovin. I have made several runners and a few quilts for Halloween. both of my kids have Halloween quilts that they use each year. I already follow your blog. I like to make table runners with Halloween fabric. I follow the blog on BL and FB. I usually make my Grandsons new pillowcases for Halloween but I might make a quilt one of these days. I follow via email, face love your tutorial. Your halloween blocks are so cute. Thanks for the chance. I follow with Bloglovin - I am making a Halloween wall hanging! I currently follow on Bloglovin. I like to make childrens quilts, table runners and pot holders for Halloween. I follow via bloglovn. Mini quilts and pumpkins are what I like to make for Halloween!! I get your email notices about your posts and do enjoy your blog. I've just made a Halloween candy basket, and also enjoy having table runners for each season/holiday. I'm following you on FB. 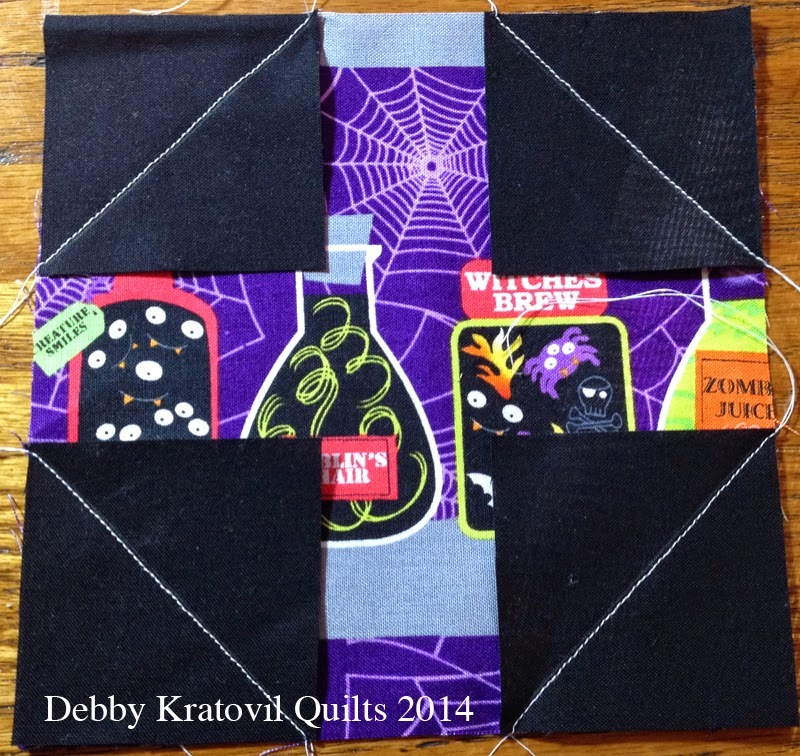 I love Halloween and making a quilt to celebrate it is on my bucket list!! Already following on Bloglovin and lovin your Autumn posts! I follow your blog on Bloglovin and I use Halloween fabric to make table runners. I am a follower via email. I haven't made any fabric Halloween stuff. Great halloween line! loved the finished quilt and the bloomers! I follow you via email. I follow you on Bloglovin and FB. I am a new quilter and have only made one small Halloween wall hanging but I have plans for more. Cute fabric! I am following on bloglovin!!! 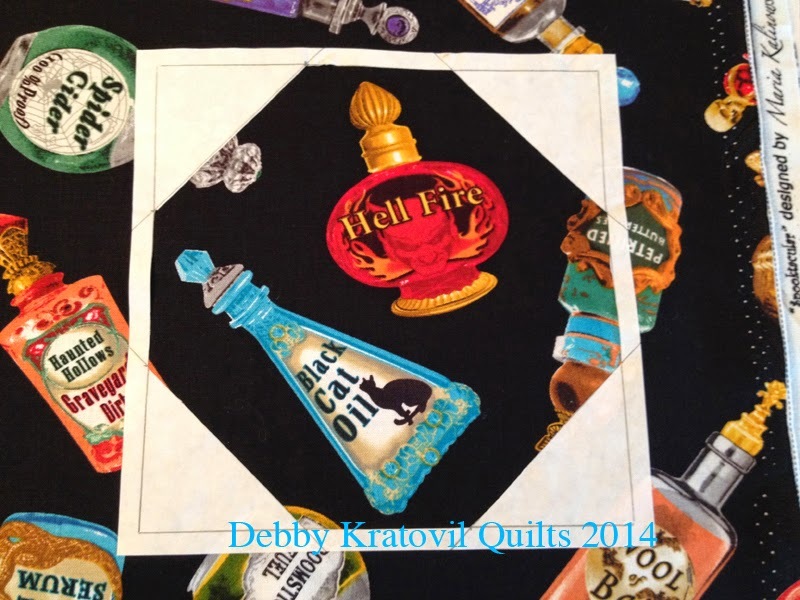 I am so happy to have you share your tutorial for this wonderful quilt. It sure feels like fall and I so want to make this quilt. I really appreciate your time and your idea to help us to make this quilt. Some of us just needs a little help and these awesome tuts sure do help us. Thank you for sharing with all of us. Bloglovin follower: Nicole Sender. Love the Halloween quilt. I followed on FB @ Jenna Osborne. I love to make everything from costumes to Halloween-themed table runners, etc. to Halloween cloth dolls! I follow by e-mail. I love Halloween fabric. I have made tons of table runners and wall hangings. Last year I made a Boo Monster Inc costume for my granddaughter. The year before I made a witches costume for myself. Last year at retreat I made a Halloween quilt for my bed. I follow by email. When it comes to Halloween it seems that I am making wall hangings, mini quilts, table toppers and runners. I really must take the time and make a Halloween quilt for cuddling under as I hand stitch and wait for trick or treating characters to come to my door. LOVE this fabric! Costume of course! I follow with Bloglovin as well as like your fb page. My Halloween sewing is typically costumes. Table runners, wall hangings and of course pillow cases for the kiddos! For Halloween I have made door hangings, a table runner, placemats and trick or treat bags. I have so much fun using holiday fabrics. I am a Facebook follower! I finished a Halloween quilt and now want to make a hanging for the front door as well as some placemats and a runner. Halloween is my favorite holiday!!! I hope I am not too late-follow via facebook. The fabrics are so cute! I haven't made anything for Halloween yet, but I would like to. I follow your blog via Bloglovin' and email. Thanks for the giveaway! I follow during Bloglovin, for Halloween I will be finishing a cloak. Thanks for the Giveawy! Guess the fabric line winners! Guess the fabric line name game! Feels Like Fall Bundle Winners! Getting ready for the holidays...with pre-cuts!